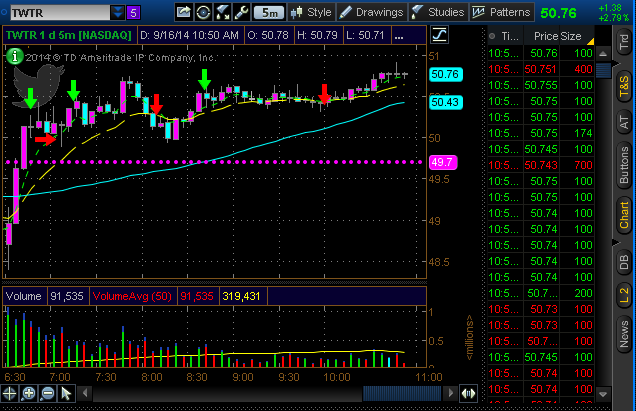 Most of the market seemed to wait for $BABA to go live so it was a very very slow morning for me. 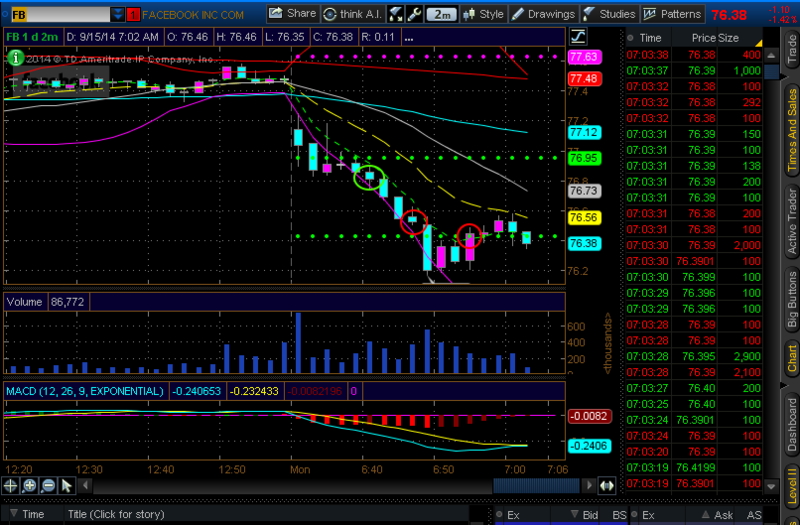 I did take one Facebook trade (short). From now on I’ll show where I scale out and where I close out. 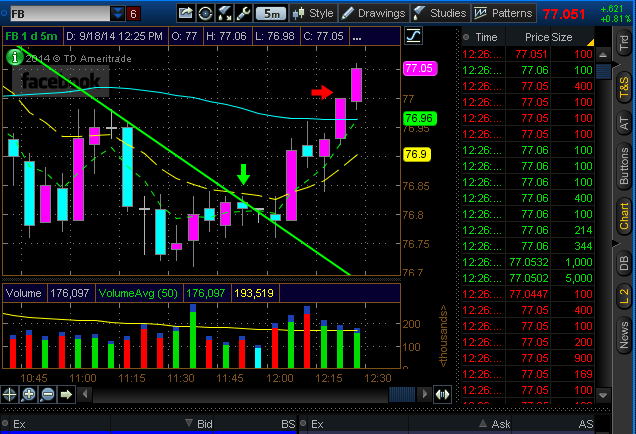 This trade was a scratch… I captured a little and closed out for -2$. 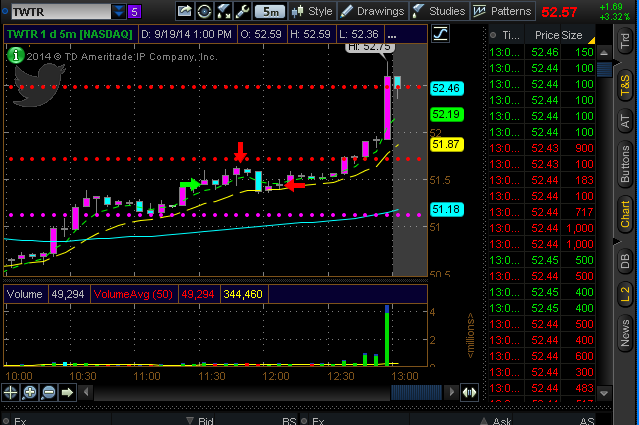 Once $BABA went live at 12EST some volume poured back into the market. My modified strategy included playing some slightly lower deltas to hopefully not get whipsawed so much. I guess another modification I’m making to my buying strategy is to wait for a slight pullback before getting in. Ideally, I want to buy at a previous break out point. I sat here with my finger on the trigger to enter Twitter but couldn’t do it. I did manage to get my setup but I could have gotten in for a much better price. 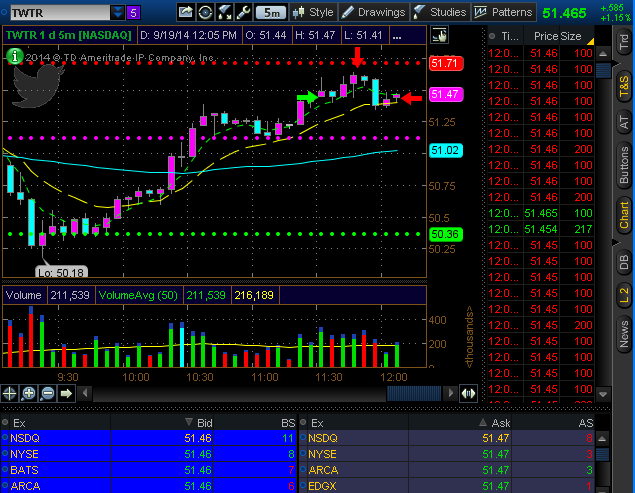 At least this was a profitable trade and I finished the day green. That always feels good. I was planning my entry around $51.15 but just couldn’t do it. The more time I’m putting in, the more technical patterns I am seeing which is good. The faster I can recognize a setup, the faster I can enter a trade at a good spot. A common occurrence in trading is leaving money on the table (selling too early). It is a good problem to have because it shows that you are locking in profits. However, as a trader, we like to call it ‘the torture chamber’ when you look back at a stock after you’ve sold and it makes a massive move. The last 15 minutes of trading Twitter was just insanity. I just sat in here disbelief because those are the kind of moves that can wash away days of losses. Anyways, I ended the day green and I’ll be ready for some explosive moves next time they present themselves. Have a great weekend. Started the day off nicely. 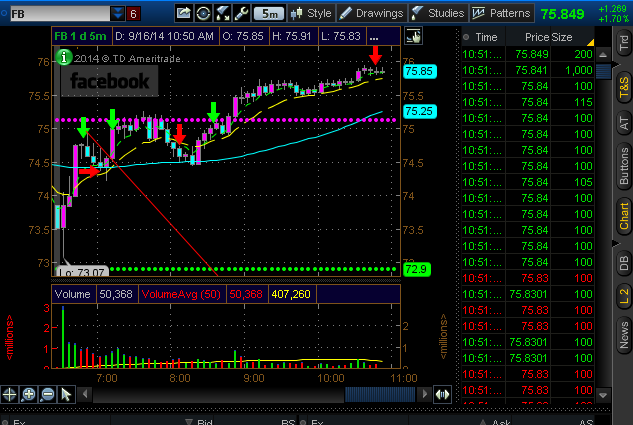 The markets appeared to have a nice strong uptrend going so I took my usual entries on both Facebook and Twitter. While I did not reach my profit target, I scaled out of both on the pops and the red arrow signals where I closed my final contract. I refused to let winning trades turn into losers. I looked to play a continuation to the upside but the market took a dive for a bit. Toward the end of the day, both Twitter and Facebook were trending down nicely. 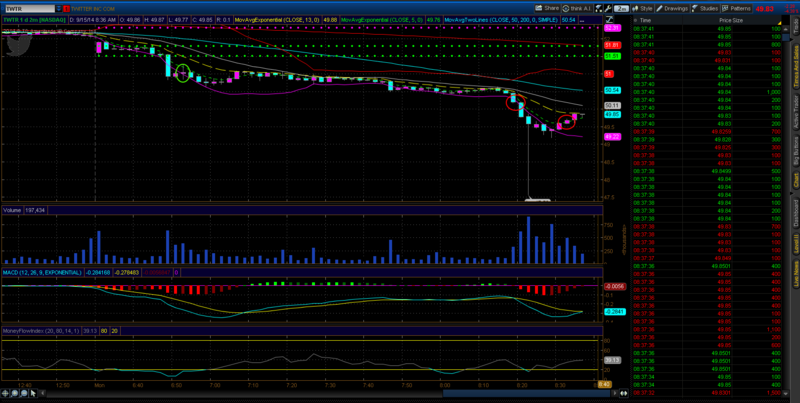 I hopped in one last trade looking for continuation to the downside. Conveniently, it happened to bounce up about 30c. That’s the beauty of the market… anything can happen. 2/4 on the day. Volume was historically low during the morning session because the FOMC minutes come out at 2EST. I decided that unless any of my setups showed a significant surge in volume I would wait until after the meeting. Per usual, the minutes caused a good amount of volatility and I just couldn’t get a grip on it. I essentially got chopped up today but because of tight risk management, I’ll live to fight again tomorrow. I really just felt like I couldn’t get a grip on Twitter… oh well. All trades today were to the long side so I was 1/3. I saw my short setup form but we were less than 30 minutes from the close so I decided to pack up and call it a day. See you all tomorrow. Edit: I forgot I did take a short trade this morning. I focused on taking profit quicker because it was a slow moving day. 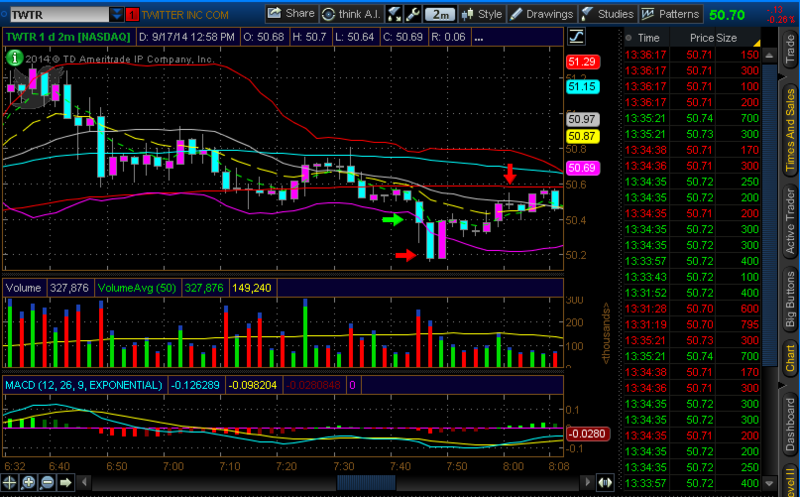 The first red arrow I scaled out of 2/3 my position and the last 1/3 I closed out for a small loss. Overall it was a winning trade so I guess I was 2/4 on the day. I really do believe I have turned a corner in regards to trading. Today I went through 5 straight losses and only toward the end did I start feeling some emotion (toward Twitter in particular… fucker just wouldn’t budge during lunch). I quickly reminded myself that nobody was out to get me, I took every opportunity that met my criteria and executed without question. One issue I did notice today is that I missed a real ideal entry and instead of ‘chasing’ just a few cents I waited for the next setup to occur. Had I given myself a little more room for entry it would have easily been a nice winner. Every trade but 1 worked in the sense that I reached my ‘risk mitigation point.’ That is where I take off 1/3 my position at the amount I use for the stop-loss (but on the positive side). Four of those six losers hit my risk mitigation points and I captured 20c on each contract. What I’m going to do in the future is tighten up my stop loss to 10c at that point so that even if she turns against me, it will be a wash and not a loss. I had 1 winning trade out of 6 and the best part is, it almost washed away all those other losses. I’m down on the day less than the amount of 1 stop loss for 1 trade. That’s the power of letting your winners ride. With a bit of tuning and experience, I’m going to be just fine. Key is to take it day by day and keep a level head. Today’s trades were all to the long side (looking for the price to go up). From here on out I’m going to use arrows to show my entry/exit. I’m not going to show all the places I scale out, just where I close the final contract. Green means I entered. Red means I exited. It’s a numbers game. If you couldn’t tell by now I am primarily focused on $TWTR and $FB… probably because I am getting a small sense of familiarity with them. I entered on the crack of the low on Twitter and I entered preemptively on Facebook. I screwed up my order and accidentally took off 2/3 my position early instead of just 1/3. I reached my profit target for $FB but normally I would leave 1 runner behind… $FB proceeded to fall another dollar but hey, green is green. 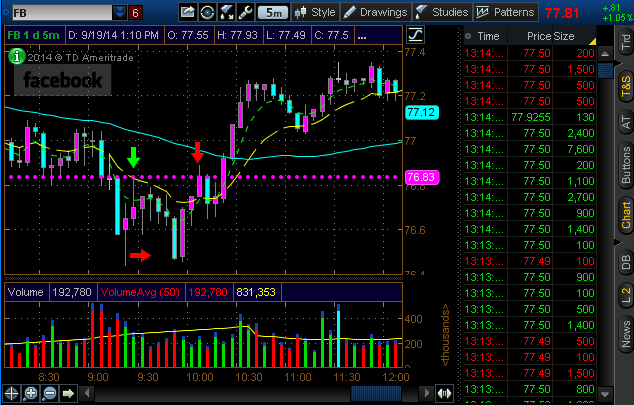 I saw the trade setup, I entered the trade, and I felt no emotions toward it when it was both in my favor or against. I’m going to rinse, wash, and repeat this every day. 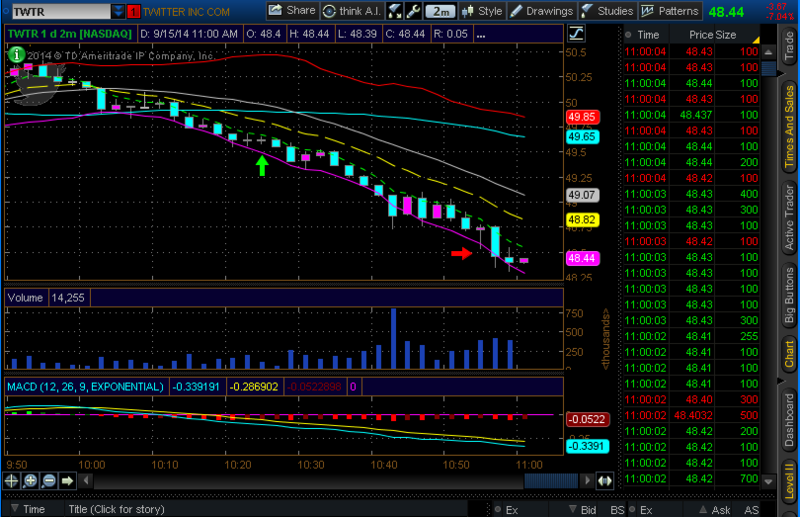 Twitter had a nice flash crash down to $47.50 so that kind of made the chart look a bit wonky. All I know is that my runner for that paid out well. 2/2 on the day. I doubt I’ll trade the afternoon session but if something sets up, you know what I will do. 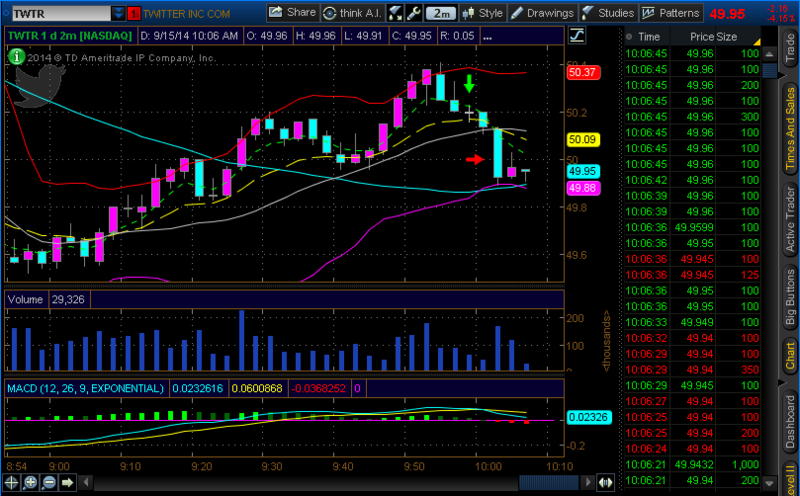 Double Edit: Took ONE MORE trade on $TWTR. 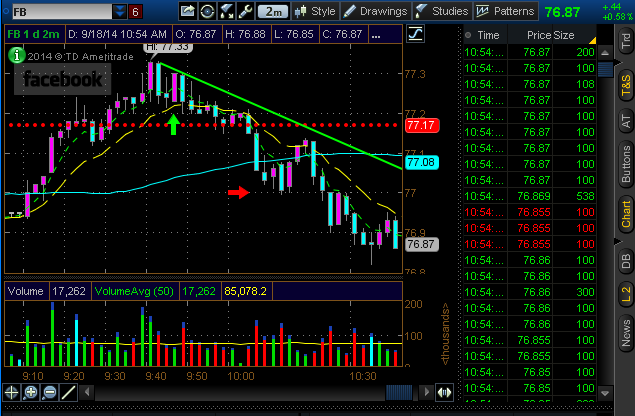 Market took a turn to the downside so once my setup showed itself, I took the trade. 3/4 positive trades on the day.